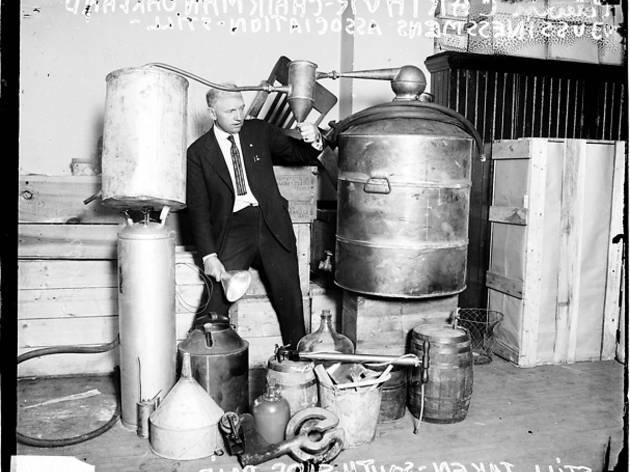 An interview with John Russick, the Chicago History Museum's Prohibition expert. Inspired by Boardwalk Empire and Time Out Chicago’s Underground Issue, we went to a historian for the facts and myths about Chicago’s speakeasy golden age. 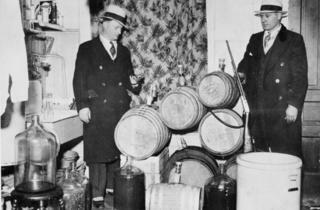 What made Prohibition in Chicago different from other cities? I would say that Prohibition affected most northern American cities in sort of the same way, in the sense that large communities had established drinking conditions and had the possibility of anonymity that was possible by the size and diversity of the city, sort of the anonymity that any of us can experience today. Being in the city, you can walk for blocks and blocks without seeing a face that you know. I think that in these contexts, there was a greater opportunity for not only a negative feeling about the Prohibition laws, but also a willingness, and maybe more of an ability than in smaller town America or rural America, to flaunt the Prohibition laws, to actually find ways to circumvent it. I would say also that cities in general had the transportation routes and the infrastructure already built in for a lot of opportunity to circumvent the laws, different pathways to bring in liquor, industries that were already in place to brew or distill out of the sight of officials who might be trying to enforce the Prohibition laws. 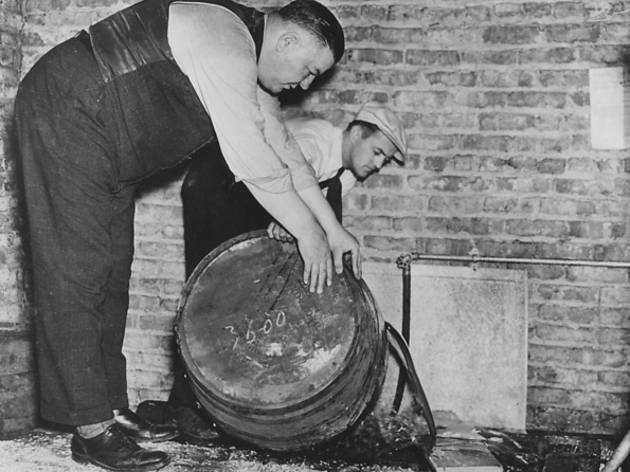 And then on top of everything else, you have an urban police force that was less inclined to enforce the Prohibition laws with all the sort of intensity and fervor one would have had to bring to the task if you really wanted to curb all drinking of any kind in Chicago. So, in Chicago in particular, we have a wide variety of transportation routes, you have the expanded way, we have the railroads, we have lots of road access, we have the lake, so there was an opportunity to bring liquor into Chicago and distribute it here that might have made Chicago more of a unique situation than a lot of its other Midwestern sister cities. Also, before Prohibition, Chicago already had a reputation of being a city that was on the make. It had a reputation as a city where anything goes. A little bit of a sense of, maybe not out and out lawlessness, but a corruption that tolerated a certain amount of vice already. Prohibition was added to a list of illegal activities like prostitution and gambling that were “hidden in plain sight” as they say in Chicago. At their height, about how many speakeasies do you think operated in the city? There’s two things here. One, nobody knows. So anybody who says they know is speculating. And the other part of it is it depends on how you define speakeasy. Is a speakeasy any place where you can drink illegally? Is a speakeasy a place where you are buying drinks from a bartender that’s just not advertised? What constitutes a speakeasy? I think that if you use general terms, a speakeasy is a place where you could go; you don’t necessarily have to be friends with the person who runs the place. If you think of them as sort of nightclubs, then there are hundreds, at least. But if you think of them a little more…you could be a little more generous with it, you think about them as not necessarily being open all the time, maybe not being open throughout the history of Prohibition, maybe they were temporary, maybe they had a shorter life span, then I think you’re talking in the thousands over the course of the 13 years of Prohibition. Some people estimate that it’s much higher than that. I just think that when we get into the definition of speakeasy and start really thinking about how they were formed and who used them, I think a lot of people may have run small operations out of their basement and that sort of thing, but I don’t know if that’s the sort of speakeasy people are thinking of when they imagine the Roaring Twenties. Are they imagining showgirls and that sort of thing? Or are they thinking of these sort of modified basements where you could sit and have a drink? What were the most popular clubs and speakeasies during that era? Well, there were lots of clubs, and one of the things I think that people forget is that a lot of what people think of as nightclubs at the height of the Prohibition era were places that didn’t necessarily ever serve liquor, but they tolerated liquor. So, it would be a nightclub. For instance, the places along The Stroll, along South State Street, where jazz music got started: the Pekin Inn and the Plantation Café, and places like this that were big in the teens and ’20s and in some cases even into the ’30s. These places were the kind of places where you might not be able to acquire alcohol, but you could come in and sit down and have sort of a nightclub-like experience, but you would have to bring your own alcohol. So, places would have setups with the drinking mixers that you would need on the table. They’re not alcoholic, but they are the mixing ingredients for making the drinks. One of the things that we have in our collection, for example are walking sticks, like canes, that have glass flasks inside them, so that people could carry a few ounces of liquor with them clandestinely. We have another great little object in our collection, a little case with what looks like four cigars inside, and each cigar is actually a shaped cork that when you pull the top of the cork, you reveal a long test tube–like shape that could have been filled with alcohol. So, hip flasks became vogue during this time because what was expected of you in most of these venues because they couldn’t really risk having the alcohol on premises. They were flashy, they were the sort of nightclub-like venue, and they would expect the patron to bring those with them. So that might be more of the speakeasy model that people are thinking of, where actually the onus was on the patrons themselves to bring the liquor with them, to actually break the law. Because, ultimately, consumption was not illegal. What was illegal was the manufacture, distribution and sale. So if these establishments could avoid any of those three, they could claim some measure of innocence if somebody brought liquor in. Everyone knows the Green Mill, but what are some examples of other places like that, the more cultured places where musicians and artists of their time would be? The Stroll is the most obvious, but it’s clearly gone at this point. South State Street was a hotbed of restaurants and nightclubs and live music joints. That was without a doubt the dominant nightlife scene in Chicago at that time. The Great Migration was in full swing, so you’ve got all these jazz musicians coming up who are changing Chicago nightlife, and you’ve got local musicians that are totally influenced by this new sound coming out of the South. So there’s a really dynamic mixture of Northern musical traditions mixing with these old Southern traditions that are now coming into Chicago and creating this new musical identity for Chicago, this early jazz sound that Joseph King Oliver and Louis Armstrong, and even locals like Benny Goodman and the Austin High Gang and Richard McFarland. These guys come and are part of this nightlife scene that’s happening along south State Street and the old Levee District. Those places like the Lincoln Terrace and the Plantation Café, these are the sorts of venues that would have been nightlife venues in which certainly some measure of violation of the Prohibition laws would have happened, more than likely. But in terms of speakeasies, other places people would have gone, in terms of a place that would have been welcoming and not necessarily an entertainment center, a more social, club-like atmosphere, there are some classic examples. The one I usually take people to is the Green Door Tavern, which I think is an example of a place that had a history of being a liquor-selling establishment, Prohibition is passed and they become a nonalcoholic restaurant, and they have this underground space in the basement where they can serve patrons drinks if they seem like they are a good risk for the owners. What are some of the more creative “fronts” that you’ve heard of to disguise speakeasies? I know John Barleycorn used to have a Chinese laundry in the back as an entrance. I don’t know of anything that I can verify like that. I know there are legends about lots of places, but it’s not a stretch of the imagination to assume that people were looking for ways to disguise their operations and yet have them be recognizable. You could describe it as a Chinese laundry in this case, and people would know it was there and would be able to find it, but it wouldn’t necessarily scream out what it was from the street. I think a lot of places went into that mode, where they looked for a veil of some kind, so they weren’t advertising too obviously. At the same time, what is important to remember is that in Chicago especially, there was a fair amount of passiveness related to enforcing Prohibition laws. So, there were raids, and there were lots of people arrested, and there were a lot of efforts by federal agents to break up some of these bootlegging operations, and there were also a lot of palms greased and people who looked the other way, and there was a fair amount of openness in Chicago in terms of your ability to find and get a drink during the ’20s. What did it take to keep a speakeasy open when people were always trying to shut them down? I think you’re talking about a sort of combination of things that depends on what ward you’re in and whose operation it is. Certainly there were gang-turf issues. You couldn’t just open a speakeasy anywhere without paying some sort of tribute to whoever controlled that territory. You have to remember that this is a black market. This is a market that has to exist outside the normal channels, the normal rules of commerce. So, there aren’t any licensing agreements, there isn’t any zoning. So, these places have to either exist under the radar, or they have to align themselves with certain gang bosses in the area that they are under the protection of. Or they have to pay off local officials that will agree to not raid their operations. One of the things we all have to remember about these operations is that while many people thought they were lawbreakers or a scourge on their neighborhood, there were a lot of people who felt like this was an unreasonable law, that were not all that excited about its passage and were not all that upset about people violating it. There were many, many people in Chicago who just wanted to be able to have a drink when they felt like it. So, there wasn’t a big public outcry very often against the speakeasies. What there was, was an outcry against the gang violence or the corrupt officials, but not so much in terms of the number of nightclubs. Were Chicagoans more likely to be drinking beer and liquor that was smuggled into the country or brewed and distilled in a basement somewhere? Well, in terms of volume, I don’t really know the answer to that. There was a lot of all of it. Alcohol obviously has more uses than simply to imbibe. There are industries that use alcohol in industrial processes, for example, and there are certain products that use it for other purposes. So there were lots of folks who were in the alcohol business who were given a license to produce so much alcohol for manufacturing. The challenge then, of course was that if you wanted to make more than your quota in order to sell it to somebody who could then flavor it and make it into some underground form of gin or something like that, what were the systems in place that you could tap into to funnel that extra alcohol out, and that’s a fairly common story. 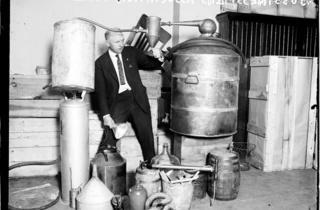 Legitimate business that were sanctioned under the Prohibition law for industrial purposes would be creating alcohol and then making more than their legal limit, and then providing it to the people who could make bathtub gin, a bathtub filled with a grain-like alcohol and then flavored to make it more palatable for the drinker. Another very common way to get liquor in the ’20s was another legal form, which was prescription alcohol. It was a common practice for medical maladies. You could get a prescription from your doctor for a certain amount of alcohol, say, to combat anxiety or something like that. So, there were doctors you could go to. You would know who the doctor was already. You would go and pay the doctor’s fee, he would look at you and say, Oh yes, you need so many ounces of alcohol per week, and he would give you a prescription, and you would go to a pharmacy and get your prescription filled. So these were other outlets where people could get alcohol through a legal mechanism, but the corruption of the mechanism meant that many more people were getting alcohol than normally would be able to. Are there any bars now that have stayed true to the way they looked in the ’20s? I can’t think of any. People talk about the Green Mill; I believe the Green Mill interior was redone in the ’30s. What’s nice about the Green Door Tavern is that it is very old. Green Door is distinctive in the sense that it is the oldest wood frame building built in Chicago after the fire. That’s kind of an odd distinction. It was built, I believe, in 1874. It’s old, it’s leaning, it has a very old feel to it. I can’t vouch that the interior is exactly the same, but it’s a good bet that it’s the kind of place that would have that feel of what it looked like pre-Prohibition or during Prohibition. They have opened up the space in the basement that they say was used as a drinking area during Prohibition, but I believe that’s all been sort of fitted out in more recent years to look like a speakeasy, but we don’t know how it looked at the time. To state the obvious, we all have to remember is that these places were clandestine. You didn’t go there to have your picture taken or to be seen. There is very little documentation of all this stuff. The history is hard for us to nail down and know for certain how these things worked, because it was all supposed to happen without anybody knowing about it. It seems like a lot of bars claim they were speakeasies, when there’s really no way of knowing. Yeah, the thing you can do is comb the newspapers of the time, and you can find locations where raids happened. These are not uncommon occurrences. They did happen and you can find them, but frequently you find that there is nothing there today to indicate that. Either the building that is there today was built after 1930, or whatever evidence that there would have been a speakeasy at the place, at the end of Prohibition is not there any longer. Every so often we get a call from somebody who found a little secret compartment inside the wall of the basement, or a secret door that has been bricked over or something like that, and they think, wow, maybe there was a speakeasy here. The truth of it is that they aren’t so rare that you think “oh no, there’s no chance.” You have to give credence to the possibility that they were. They were not uncommon. They just might look a little different from what people imagine from Hollywood movies, not so glamorous all the time. 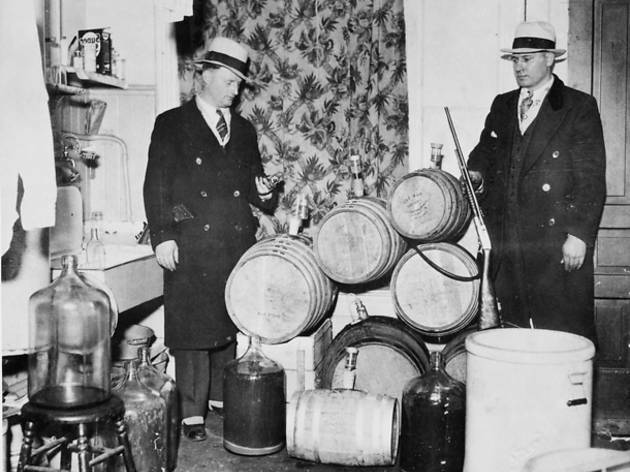 Was Prohibition really the most alcoholic era in American history, as some have claimed? Well, Prohibition comes about because alcohol is sort of out of control in the 19th century. The whole reason for creating Prohibition is because the temperance movement fights for 100 years to get people to stop drinking themselves to death: stop destroying their families, stop destroying their lives. Alcohol production and consumption in the 19th century is vastly more potent. The alcohol is more potent and more dangerous. There’s little or no regulation of the liquor industry; there are few, if any legal drinking ages established, so it’s not illegal for children to drink. The temperance movement started with the Sunday Laws to try to keep people from drinking at least one day a week. They tried to control the consumption just a bit at the beginning, just trying to get fewer saloons in their town or religious leaders trying to convince people not to drink. Trying to convince the men to hang on to their money on payday. But there’s alcoholism and nobody really know what it is. Well, they know what it is, but they don’t understand how to deal with it. They just know that there’s this drink at the core of it that’s destroying a lot of people’s lives. Obviously we have a smaller population in the early 19th century; we still have a culture that is getting used to having alcohol in a way that is kind of breaking out of whatever European traditions these folks came from. There’s a widespread use of alcohol in the United States, and it’s expanding, and it’s becoming a problem. So if you think about that as the impetus for passing the Prohibition law in the first place, efforts to moderate drinking aren’t really working in the views of the temperance movement, so they reach for this really big stick, this really imposing law that says okay, nobody gets to drink, ever, except under these very few occasions. So, then what you find is that you’ve got an overreaching law that so much of the population is not in support of, that you sort of, in a way, flip back to the same problems that you saw in the 19th century. You have excessive drinking, you have a population that thinks the federal government is infringing on personal liberties that they don’t have the right to do. So you haven’t created a worse situation, but it isn’t a much better situation. You’ve still got drinking, but now it’s happening underground, you don’t even know where its going on, where you used to at least know where it was. It was happening right on Main Street before. What does happen is after Prohibition laws end; the compromises that are made to regulate alcohol are pretty significant. You have no minors drinking, and you have regulation of quality liquor production, and you have ordinances governing hours that saloons can be open, you have a lot of dry municipalities that don’t repeal Prohibition. 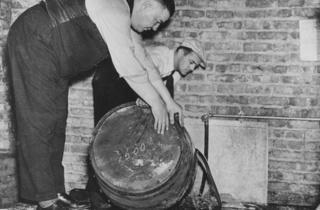 They retain their dry laws after 1933, so while the national repeal of Prohibition happens in 1933, for many years, right here in Illinois, you have lots of communities that don’t repeal their liquor Prohibition laws. So people who live in dry towns or dry counties have to drive to the next town over or cross state lines to get liquor. So it actually takes many decades after Prohibition before you get liquor consumption back up to pre-Prohibition era. Have you seen Boardwalk Empire? No I have not, but everyone keeps telling me I’d love it.